Alstonville accommodation and tourist information guide, New South Wales, NSW, 2477, New South Wales, Australia. Visitor guide, how to get to Alstonville and Alstonville weather. Also Wollongbar, Tintenbar (tintinbah), Teven. Ballina Tourist Information Centre - ph. (02) 6686 3484. Located on the Bruxner Highway about half way between Lismore and Ballina, many visitors to the region make a day trip to the Alstonville Plateau to take in the stunning views, and to visit popular local attractions. Atop the rich krasnosem soils which previously supported the "Big Scrub", Alstonville and Wollongbar are communities serving a thriving agricultural industry and workers who commute to Lismore and Ballina. In addition to the more conventional dairy and beef farming, macadamia orchards abound in the smaller villages, while bananas, peanuts, pawpaws, pineapples and other exotic and subtropical fruits are being successfully grown. Motor Inns, B&Bs and farmstays are the primary accommodations available on the plateau, and in the smaller settlements like Tintenbar and Teven, which also boasts an excellent golf course. Alstonville Showground has powered and non-powered site pet friendly and RV suitable sites, with full amenities available for short or long term stay. Book on site or through the caretaker on 02 6628 0358. Popular local attractions include Summerland House with No Steps, with a restaurant, retail nursery, arts and crafts outlet and function centre. One of Wollongbar's original homesteads, "Killarney" (circa 1900), has been renovated and transformed into a popular steakhouse, the "Bellowing Bull". And for the sweet toothed fudge connoisseur, check out the offerings at "Duck Creek Emporium" in the Plaza shopping centre at the roundabout. A variety of day tours, river cruises and activities are also available at Ballina. 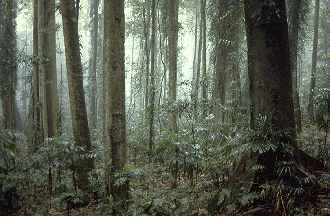 Lumley Park offers a self guided walk of the rainforest trees of the town, a three acre "Big Scrub" remnant. Orginally home to croquet lawns, this forest bushland was regenerated by the local Scrub Reserve Committee. Information boards at the entrance into the forest remnant, which features a winding walk, details some of the 102 Australian native flora & fauna species which can be found here, including a large flying fox colony. Car parking, and BBQ and picnic facilities are across the road from the entrance. A short drive out of Alstonville will bring you to Tucki Tucki Nature Reserve and Victoria Park Nature Reserve, two other forest pockets which provide an insight into the diversity of the rainforests that once made up the "Big Scrub". The New South Wales National Parks and Wildlife Service (NPWS) northern regional office is headquartered here, and manages a wide variety of parks and reserves, including the World Heritage listed parks of the Border volcano group. Getting to the region is easy: Alstonville is approximately 742 kilometres - about 10 hours drive north from Sydney, and about 197 kilometres, or about 120 minutes drive south from Brisbane, via the Pacific Highway. Driving options include the Pacific Highway, New England Highway and Summerland Way in New South Wales, and Pacific Highway and Mount Lindesay Highway from Queensland. Daily interstate coach services are available from Byron Bay or Lismore to Brisbane, Sydney and Melbourne, and daily or overnight train from Sydney to Brisbane via coach transfer at Casino. Visit Alstonville - Transport Services Information for more transport information, including trains, coach and local bus schedules, taxis, airport, and transfer services. Northern Rivers Carpool provides locals and visitors with the opportunity to share transport in the region.